BM – Bergamot Marmalade. (1/3) Drove back to the city yesterday morning to meet Sybil at the Ferry Plaza Farmers’ Market and check in with some of my old vendors i haven’t seen since last October. Stopped at Hamada’s to let Cliff know i was eagerly anticipating this year’s Marsh grapefruit crop in February, and out of the corner of my eye noticed “Bergamots” and figured they might make a good marmalade. So i bought five pounds. Got back here and went online to discover that it’s pretty complicated. Thank goodness i’ve bought Citrus limetta, popularly called Bergamot in France and which according to several sources makes excellent marmalade rather than C. bergamia, called Bergamotta in Italy and grown for its rind oil, the fruit being variously described as “inedible” and even “toxic”. Pickled Brussels Sprouts. (1/8, 2/25) Iacopi had spectacular marble-size Brussels sprouts, so i bought a bag to pickle. Yellow mustard seed, a garlic clove, and a couple of long peppers or a fiery dried red chile. 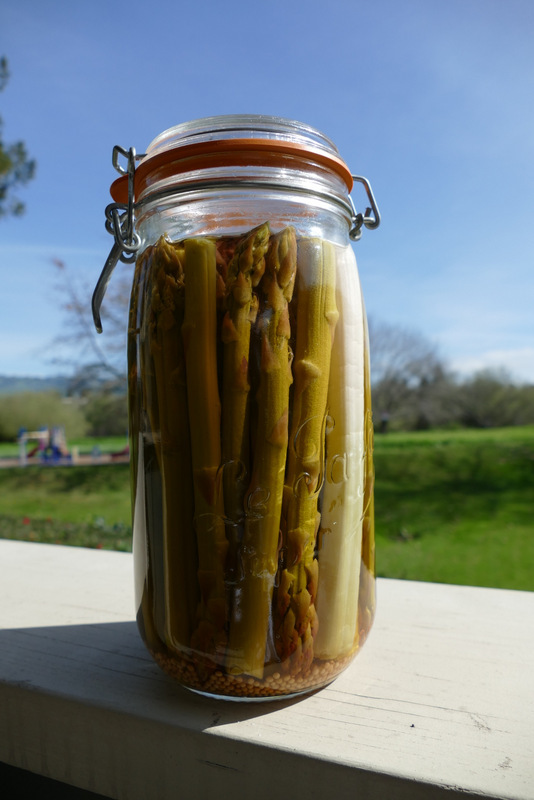 Pickled Asparagus. (2/24, 3/1, 3/25) Last Sunday i spotted the first of this year’s asparagus crop at the Marin Farmers’ Market and grabbed three bunches. After i snapped off the tough butts, i trimmed them to fit into the two jars i had but discovered as i was filling the jars that i’d not bought enough for two jars and ended up going ahead and filling the jars with the tender butts that i’d planned to just blanch and eat. Doesn’t look as pretty as a jar with nothing but the tips, but tastes just as good. Next time i’ll be sure to buy enough to fill the remaining two jars i have. Pickled Snow Peas (3/1) Went to the Alemaney Farmers’ Market with Ruth last Saturday and was reminded of how much i like this market and that it will be pretty much my closest market when i move to Coleridge Street in a few months. Picked up good fresh green garlic and asparagus at half the price of the Marin Farmers’ Market, but the prize was the first snow peas of the season. Made ten jars, all with a stalk of fresh green garlic and mustard seed, and half with long peppers, half with a couple of Chile Pequin. Probably should have used only one of those little firebombs. KPJ – Kiwi Padrón Jam (3/4) Kiwi fruit from Glenn Tanimoto at the Alemaney. Cooked with apple, lemon juice, and Padrón peppers i’d sautéed in olive oil and sealed in small jars last summer. A good combination. SAL – Strawberry Jam (4/14) Strawberries from a little farm stand on the west side of Petaluma Boulevard North, just south of the factory outlets. Good berries and nice people. Pickled Sugar Snaps (4/21) I picked these sugar snaps up from the folks who have that strawberry farm above. Threw a chile pequin, a clove of garlic, and some mustard seed into each jar. Turns out they will also have through the summer various other vegetables, and i’ve put in my order for snow peas. SJAL – Strawberry Jalapeño Jam (4/27) I seem to have found the wimpiest Jalapeños on the planet when i bought three big ones the other day at Lola’s to put into this jam. I cautiously chopped two in to begin with and then, when i couldn’t taste any heat, threw the third one in to virtually no avail. Only marginally detectable. But wait, now i remember, they get hotter as the season progresses. In any case, this is a good jam because as an experiment i used only one level quart of sugar for half a flat of berries and just kept boiling the jam down to thicken it. So it’s low sugar, high flavor. Ummm, lower sugar. CBCJ – Curried Brooks Cherry Jam (5/4) I found Brooks cherries at the little farm stand on North Petaluma Boulevard and a little jar of Thai curry paste in my pantry, so it was an arranged marriage. I’ll roast a pork belly and serve this on the side. AAL – Apricot Jam (5/13) Apricots from the little farm stand cooked down until the jam set very firm. PLM – Ponderosa Lemon Marmalade (5/14, 5/20) My friend Stephen’s friend Angie had a Ponderosa lemon tree in her yard and offered him some. He passed ’em on to me. Thus this marmalade. I gave her four jars in hopes that she and i could cut out the middleman next year because it turned out very tasty, but then i learned that i got this windfall because her tree had been accidentally uprooted. So if i offer you a jar of this stuff, you rate because i don’t have another source for this wonderful fruit. She gave me enough to make another half batch on the 20th, and into this one i threw a couple of vanilla beans as an experiment to see whether any vanilla flavor will shine through. Will be wonderful if it does. Blue – Blueberry Jam (5/19) Got six baskets of blueberries from the Little Farm Stand, threw ’em into the slow cooker with a shredded apple and the juice of a lemon for 15 hours, stuck the stick blender in for a couple of minutes, and ended up with six jars of jam. Tastes good if you like blueberries. APMJ – Aprium Jalapeño Jam. 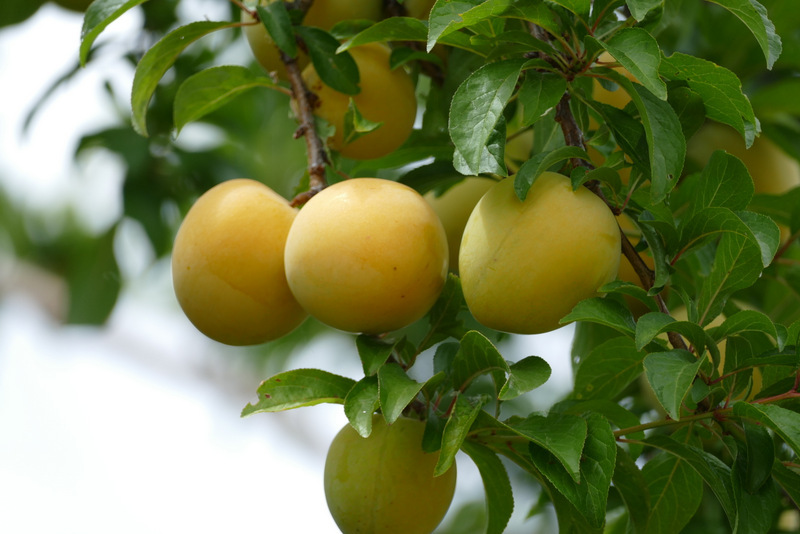 (5/26) Last Saturday i spotted apriums (an apricot-plum hubrid that takes more after the apricot) at Hamada’s and bought a bag. Cut ’em up and added a small zested lemon, a shredded apple, and three young seeded and deveined Jalapeños, just enough to taste. A good jam. CPK – Cherry Jam with Patak’s Lime Relish. (6/21) I nearly let cherry season get by me this year without making this crowd-pleasing jam. Bing cherries flavored with Patak’s Lime Relish and a couple of Jalapeños. Got the capsaisin level up pretty high on this one, so it’s not really for your morning toast. PRPC – Petaluma River Plum Chutney (6/28) About fifty yards south of me there’s a plum tree that overhangs the flood wall, and we all know that fruit that hangs over the fence is up for grabs. In this case, especially so since the house is vacant. Have no idea what variety they are, but they’re a bit larger than golf balls and bright yellow when ripe. I picked some on the green side for this chutney, and i have to say i got the right number of Jalapeños in it. Form a line. 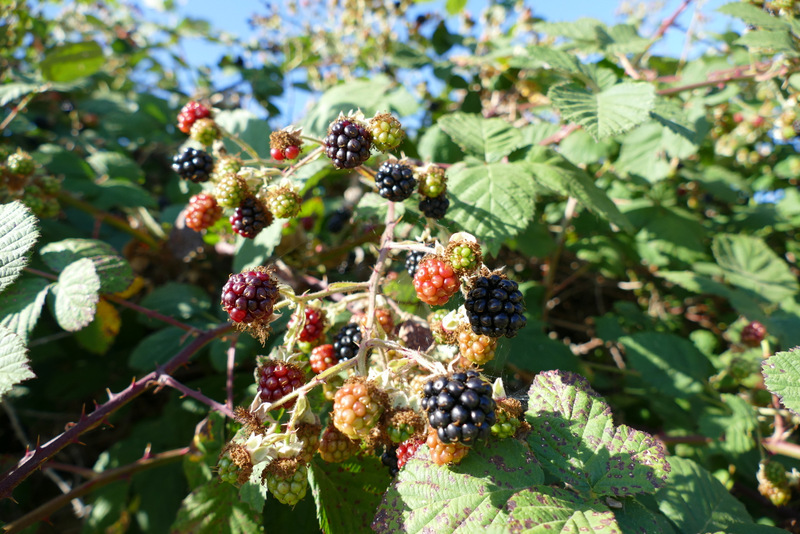 PRBB – Petaluma River Blackberry Jelly (6/29, 8/17). Just this side of the plum tree there are blackberry vines hanging over the flood wall, so i’ve been going out in the morning and picking some and freezing them until i had enough for a completely traditional jelly. PRPR – Petaluma River Plum and Rhubarb Jan (7/1) “My” plum tree now has Someone Else. When i took Christian out there yesterday to show him the tree groaning with ripe plums from which he wants to make an alcoholic beverage, i was shocked to see that virtually all the low-hanging fruit had been picked. Good thing i already had four pounds of the ripe fruit in my refrigerator. And a pound of Jo Ann’s rhubarb. Thus this jam. At this level the rhubarb doesn’t take over and serves primarily as a thickener while subtly flavoring. BBCAJ – Petaluma River Blackberry, Crab Apple, and Jalapeño Jelly (7/16). Yep, blackberries from the vines hanging over the flood wall, crab apples from a tree at the south foot of the Payran Street Bridge whose owner had given Christian picking permission, and three seeded and deveined Jalapeños which was just enough to very lightly flavor the jelly. Oh, and here’s the blackberries. Petaluma River Blackberry Vinegar – (31 July, 17 Aug). From the 29 June and 16 July jellies. 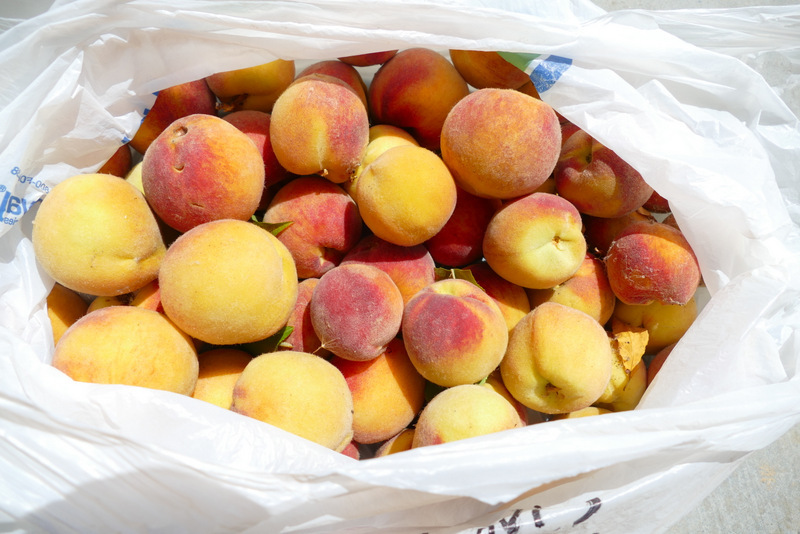 WPRPC – Wild Petaluma River Peach Chutney (12 August) OK, the peaches aren’t really wild. They’re off a tree growing in the landscaping for the pumping station at the Payran Street bridge. Tiny. The largest are the size of a golf ball, but they have a good flavor. I picked these while they were still hard since you don’t want fully ripe fruit for a chutney. Used my standard chutney recipe except for using more of Patak’s lime relish instead of the Jalapeños and a combination of dried cherries and dried apricots instead of the raisins. Shoulda gone out and bought some Jalapeños because there’s not much heat there. Oh, and i gotta mention that that old trick of blanching peaches in boiling water so you can just slip the skins off doesn’t work for underripe peaches…even if you blanch the damn little things twice. So i had peel all five pounds of ’em. Shoulda titled this thing Tedious Petaluma River Peach Chutney. MC – Mango Chutney (14 September) Spotted a great bargain on Mexican mangos the other day and made a chutney of ’em. Went ahead and used some of the peppers off the bush i’m growing on my patio. The start was labeled “Anaheim”, but the peppers weren’t getting anywhere near that big so i figured they just weren’t getting enough sun. No, turns out they are Jalapeños and made this batch of chutney way hotter than usual. Not for the kiddies. PljAL – Pluot Jam with a Hint of Jalapeño (22 November) We haven’t had a freeze yet, but the weather has been cooler, so the locals are still picking the last of the Flavor Fall variety of Pluots. Picked up five pounds and cooked them down with the juice of a couple of limes and two shredded small apples. To brighten it up, i added one seeded and deveined Jalapeño from my patio, just enough to be barely detectable. BOM – Blood Orange Marmalade (22 & 23 December) It worked out so well last year that i again prevailed upon Olsen to bring me in some of his blood oranges before they were fully ripe so i could make a marmalade of them. He comped me a second bag, so i made two batches. Perhaps my most popular marmalade.